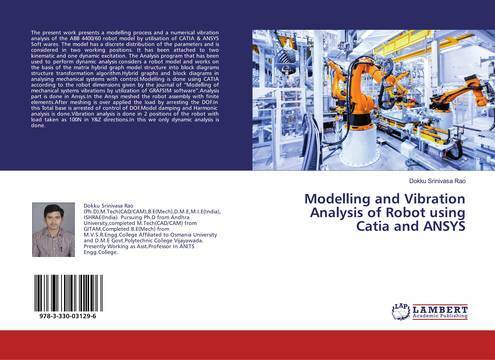 The present work presents a modelling process and a numerical vibration analysis of the ABB 4400/60 robot model by utilisation of CATIA & ANSYS Soft wares. The model has a discrete distribution of the parameters and is considered in two working positions. It has been attached to two kinematic and one dynamic excitation. The Analysis program that has been used to perform dynamic analysis considers a robot model and works on the basis of the matrix hybrid graph model structure into block diagrams structure transformation algorithm.Hybrid graphs and block diagrams in analysing mechanical systems with control.Modelling is done using CATIA according to the robot dimensions given by the journal of “Modelling of mechanical systems vibrations by utilization of GRAFSIM software”.Analysis part is done in Ansys.In the Ansys meshed the robot assembly with finite elements.After meshing is over applied the load by arresting the DOF.In this Total base is arrested of control of DOF.Model damping and Harmonic analysis is done.Vibration analysis is done in 2 positions of the robot with load taken as 100N in Y&Z directions.In this we only dynamic analysis is done. Vibrational Analysis, CATIA, Ansys, Robot.